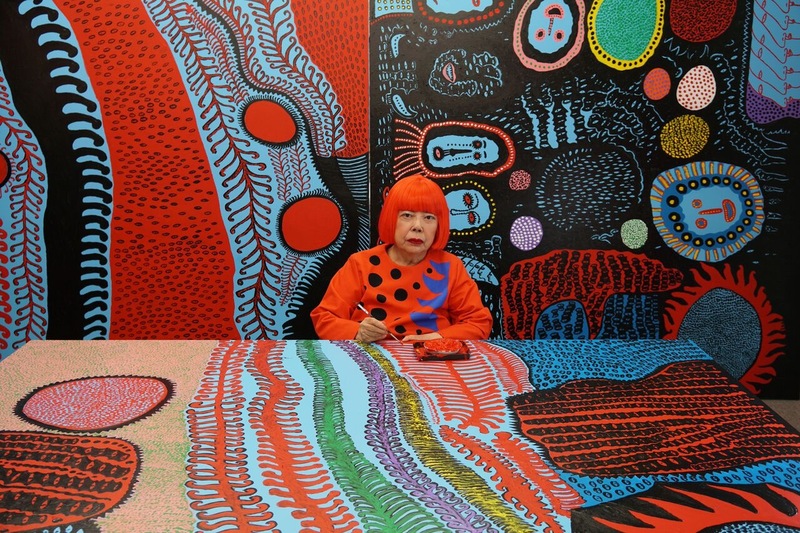 Portrait of Yayoi Kusama in her studio. Image © Yayoi Kusama. Courtesy of David Zwirner, New York; Ota Fine Arts,Tokyo/Singapore/Shanghai; Victoria Miro, London; YAYOI KUSAMA Inc.
David Zwirner presents two major concurrent exhibitions of recent work by Yayoi Kusama on view across three gallery spaces in New York: Festival of Life at 525 and 533 West 19th Street in Chelsea and Infinity Nets at the recently opened space on 34 East 69th Street on the Upper East Side. The exhibitions will feature sixty-six paintings from her iconic My Eternal Soul series, new large-scale flower sculptures, a polka-dotted environment, and two Infinity Mirror Rooms in the Chelsea locations, and a selection of new Infinity Nets paintings uptown. 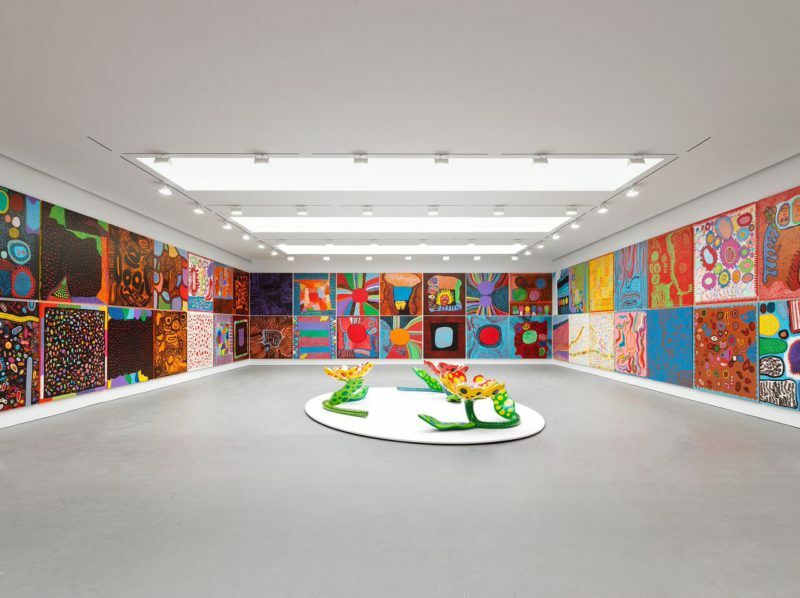 Tokyo/Singapore/Shanghai;​ ​Victoria​ ​Miro, London;​ ​YAYOI​ ​KUSAMA​ ​Inc. Yayoi​ ​Kusama,​ ​Installation​ ​view,​ ​​Yayoi Kusama:​ ​Festival​ ​of​ ​Life,​ ​​David​ ​Zwirner,​ ​New York,​ ​2017.​ ​Image​ ​©​ ​Yayoi​ ​Kusama. 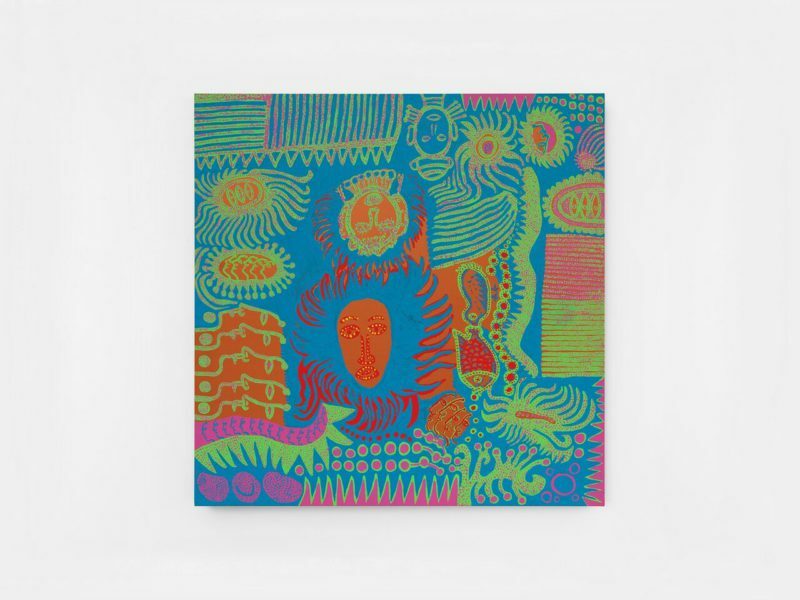 Courtesy​ ​of​ ​David​ ​Zwirner,​ ​New​ ​York;​ ​Ota Fine​ ​Arts,​ ​Tokyo/Singapore/Shanghai; Victoria​ ​Miro,​ ​London;​ ​YAYOI​ ​KUSAMA​ ​Inc. 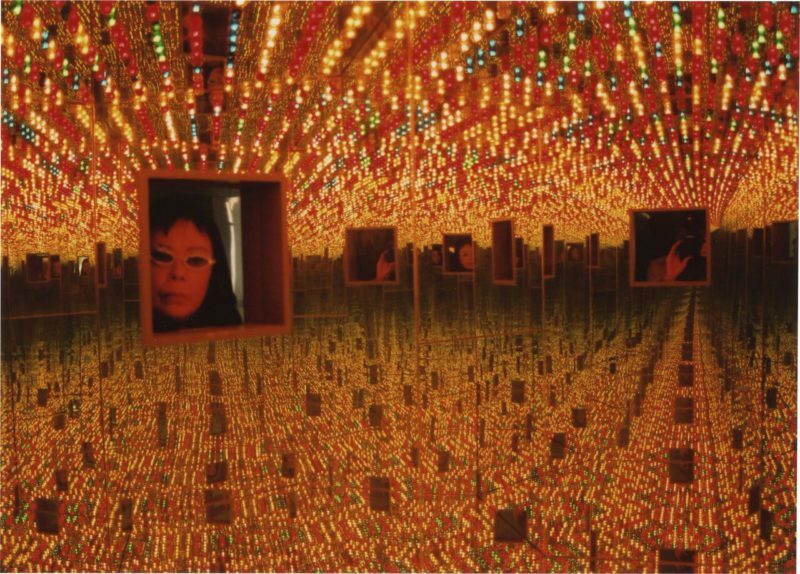 Kusama’s work has transcended some of the most important art movements of the second half of the twentieth century, including Pop art and Minimalism. Born in 1929 in Matsumoto, Japan, she briefly studied painting in Kyoto before moving to New York City in the late 1950s. She began her large-scale infinity net paintings during this decade, and went on to apply their obsessive, hallucinatory qualities to three-dimensional work. In a unique style that is both sensory and utopian, Kusama’s work—which spans paintings, performances, room-size presentations, sculptural installations, literary works, films, fashion, design, and interventions within existing architectural structures—possesses a highly personal character, yet one that has connected profoundly with large audiences around the globe. Throughout her career she has been able to break down traditional barriers between work, artist, and spectator. Yayoi​ ​Kusama,​ ​​Infinity​ ​Mirrored​ ​Room-Love Forever​,​ ​1966/1994.​ ​Installation​ ​view,​ ​YAYOI KUSAMA,​ ​Le​ ​Consortium,​ ​Dijon,​ ​France, 2000.​ ​Image​ ​©​ ​Yayoi​ ​Kusama.​ ​Courtesy​ ​of David​ ​Zwirner,​ ​New​ ​York;​ ​Ota​ ​Fine​ ​Arts, Tokyo/Singapore/Shanghai;​ ​Victoria​ ​Miro, London;​ ​YAYOI​ ​KUSAMA​ ​Inc. Presented in a tight grid in one of the largest configurations ever executed by the artist, here covering the entirety of four walls, the recent My Eternal Soul paintings on view are part of a highly celebrated, ongoing series begun in the late 2000s. 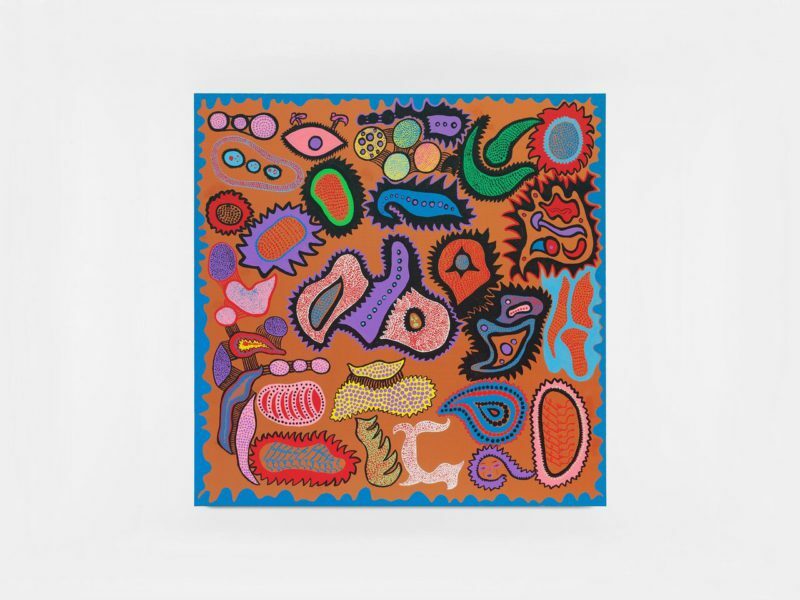 Conveying the extraordinary vitality that characterizes Kusama’s oeuvre, each composition is an innovative exploration of form, subject matter, and space, in which abstract and figurative elements combine to offer impressions of both microscopic and macroscopic universes. Yayoi​ ​Kusama,​ ​​HUMAN​ ​BEAUTY​ ​OF SMILES​,​ ​2015.​ ​Image​ ​©​ ​Yayoi​ ​Kusama. Courtesy​ ​of​ ​David​ ​Zwirner,​ ​New​ ​York;​ ​Ota Fine​ ​Arts,​ ​Tokyo/Singapore/Shanghai; Victoria​ ​Miro,​ ​London;​ ​YAYOI​ ​KUSAMA​ ​Inc. 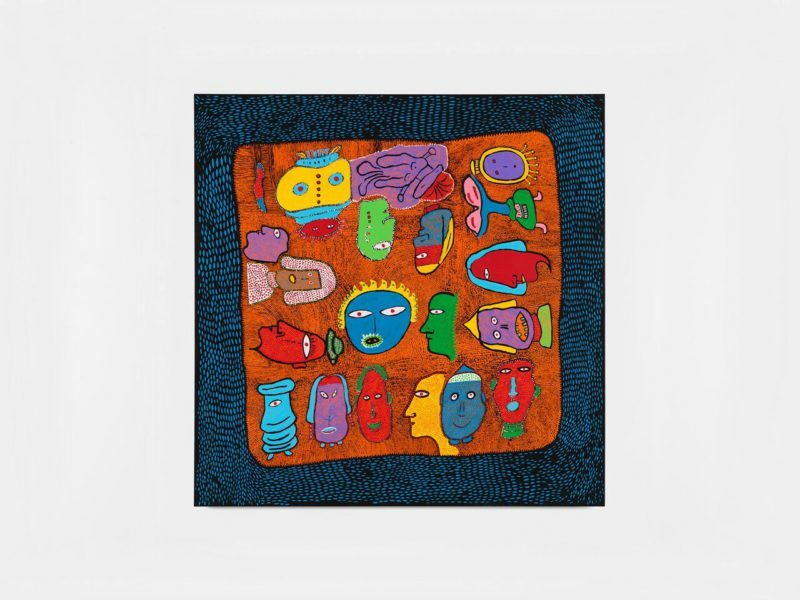 Yayoi​ ​Kusama,​ ​​IT’S​ ​ME​ ​WHO​ ​IS​ ​CRYING OUT​,​ ​2013.​ ​Image​ ​©​ ​Yayoi​ ​Kusama. Courtesy​ ​of​ ​David​ ​Zwirner,​ ​New​ ​York;​ ​Ota Fine​ ​Arts,​ ​Tokyo/Singapore/Shanghai; Victoria​ ​Miro,​ ​London;​ ​YAYOI​ ​KUSAMA​ ​Inc. Yayoi​ ​Kusama,​ ​​TEARS​ ​WITHIN​ ​THE HEART​,​ ​2016.​ ​Image​ ​©​ ​Yayoi​ ​Kusama. Courtesy​ ​of​ ​David​ ​Zwirner,​ ​New​ ​York;​ ​Ota Fine​ ​Arts,​ ​Tokyo/Singapore/Shanghai; Victoria​ ​Miro,​ ​London;​ ​YAYOI​ ​KUSAMA​ ​Inc. Placed within the vibrant, immersive environment created by the paintings, Kusama’s new stainless steel sculptures depict fantastically scaled, individual flowers featuring the artist’s distinctive bold palette. Made from stainless steel and covered with urethane paint, their exaggerated features and horizontal orientation echo the dualism found throughout her work between the organic and the artificial. 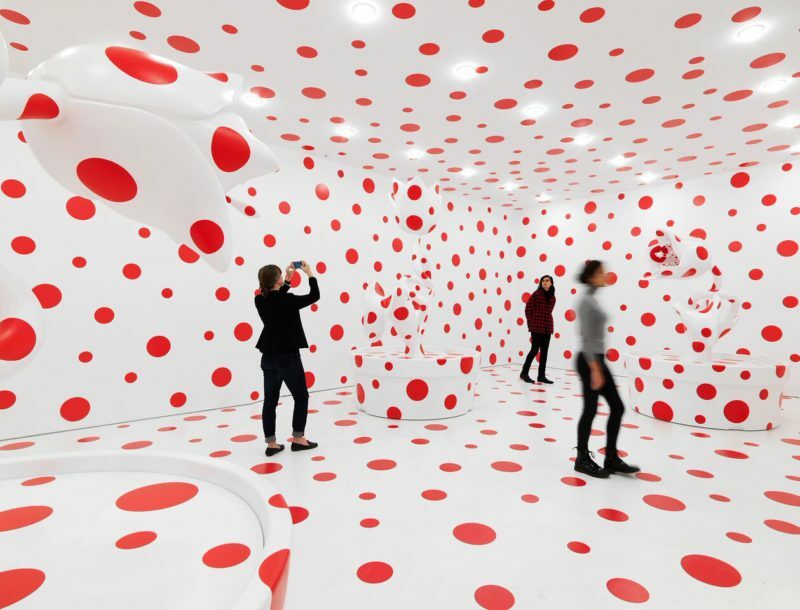 This is also evident in With All My Love For The Tulips, I Pray Forever (2011), a sculptural installation—shown for the first time in the United States—in which oversized flower-potted tulips in fiberglass-reinforced plastic are painted with the same red polka dots as the floor, ceiling, and walls, creating an all-enveloping viewing experience while at the same time diminishing the appearance of depth. The exhibition debuts two new Infinity Mirror Rooms, one which invites the viewer to look inside through three peepholes, and another which can be experienced from within. In the former, miniature light bulbs in changing colors reveal a hexagonal pattern that is mirrored endlessly. The latter envelops the visitor inside a large mirrored room with stainless steel balls suspended from the ceiling and arranged on the floor; an enclosed column within the room offers yet another mirrored environment accessible through peepholes. A sense of infinity is offered through the play of reflections between the circular shapes and the surrounding mirrors. 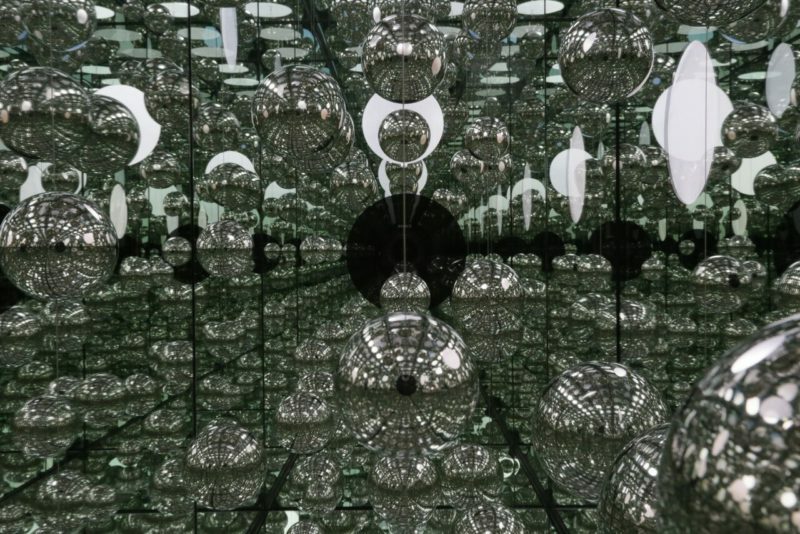 The balls recall Kusama’s installation Narcissus Garden, first shown outdoors at the 33rd Venice Biennale in 1966 with over 1500 reflective spheres and recently presented in the United States at The Glass House in Connecticut. 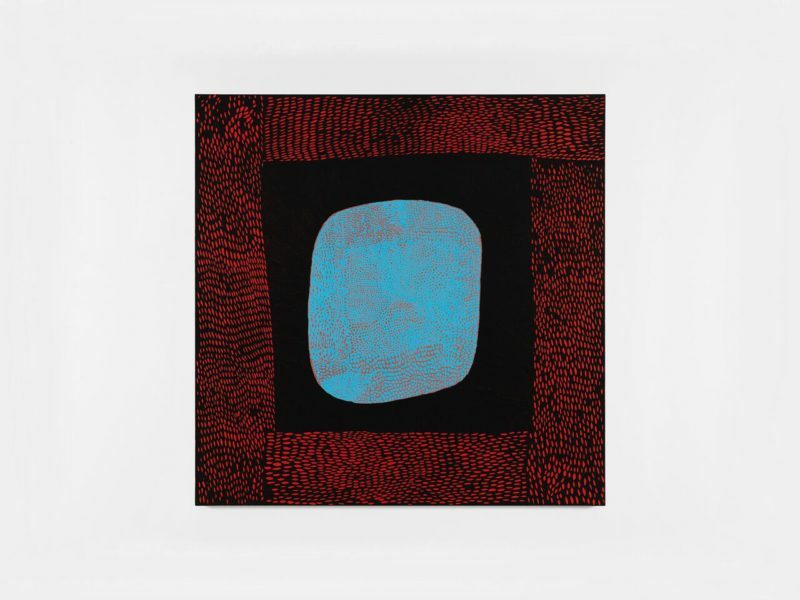 The Infinity Net paintings on view at the gallery’s uptown location are the latest works in a series begun in New York in the 1950s, when Abstract Expressionism was still the dominant style. These canvases embodied a radical departure, featuring minutely painted nets across monochrome backgrounds. Donald Judd was an early admirer of these works and an exhibition currently on view at Judd Foundation on 101 Spring Street in New York presents four recent, white paintings from the series as part of a program that explores Judd’s relationship with his contemporaries in the 1960s through the 1980s (through December 9). In 2018, David Zwirner Books will publish a fully illustrated exhibition catalogue with new scholarship by Jenni Sorkin.